ROAD TOWN, Tortola, VI - Digicel has announced that it has partnered with local businesses to make this Christmas extraordinary for over 5,000 lucky residents of the Virgin Islands. 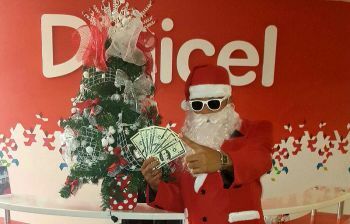 Digicel promises even more prizes and more winners when we get ALL IN this holiday season. Every Friday for the next 5 weeks, Digicel will be hosting Festive Fridays where customers will enjoy amazing deals at all Digicel Stores on Tortola and Virgin Gorda. Also Digicel customers can win cash when they find Digicel’ s Secret Santa every week, while customers are also rewarded with prizes including smartphones, tablets, data plans, Digicel top up and RiteWay supermarket vouchers. And it’s so easy to get ALL IN and win - prepaid customers just have to activate an ALL IN plan or any 4G Mobile data plan, and top-up $20 or more to have a chance to win. The more often people activate plans and top up the more prizes to be won, and the greater the top up amount the more entries in the draw. Digicel’s postpaid customers qualify by paying their bill in full and on time, and will be entered into the weekly draw to win cash and prizes. So, it pays to pay your bill and as early as possible this Christmas to be in with a chance to win every week. For the second year, Digicel has joined forces with Tree of Hands and the Family Support Network to support less fortunate families throughout the Territory. While they are also bringing the Christmas spirit across the Virgin Islands with their famous festive roadshows visiting five locations over five weeks where Digicel customers can get ALL IN by grabbing their share of cash and prizes. I'm finding that Santa on Friday get me cash.